Baton Rouge, LA – The University of Louisiana System and the online education platform MyEdu today announced a partnership designed to connect the system’s 92,000 students with employers as they progress through their academic journey. By leveraging the scale of the UL System’s nine universities and the power of the MyEdu platform, students will have the tools to be able to complete their degrees in less time, establish a professional profile to better represent their skills and expertise, and connect with employers, internships, and jobs early in their academic journey. “A recent national study found that over half of recent graduates were either unemployed or not working in a job consistent with their degree. We are determined to make sure this does not happen to our students,” said UL System President Sandra K. Woodley. According to Woodley, the goal of the partnership is to make it easier for students to establish goals that will lead them to a meaningful career, stay on track with courses, find exciting internships in their field, and connect with potential employers early in their college years. “We are excited about these innovative tools because we think they will make a difference for our students, and student success is our highest priority. Another high priority is meeting workforce demand and this initiative gives employers a smarter, more efficient way to recruit the talent they need,” said Woodley. Thousands of students on UL System campuses already use MyEdu’s free online academic and career planning tools to schedule classes, develop personal education plans, and access other applications. Now, even more students will be joining and creating profiles to tell their stories in ways that traditional résumés can’t. Lewis said students do a lot of innovative things but don’t always know how to promote themselves. “Maybe you’re an engineering student, but you’ve only had the privilege to work in a pizza place or on campus in the bookstore. This is a way that you can show, even though you haven’t had engineering jobs, that you’re serious about engineering. Maybe you did a class project where you built a mechanical robot that irons clothes. You’ll want to highlight that project and the skills you developed in the process,” Lewis said. MyEdu is available at 800 higher education institutions and throughout the country and offers students access to millions of jobs and internships from top college recruiters like AT&T, New York Life, Polaris and others. 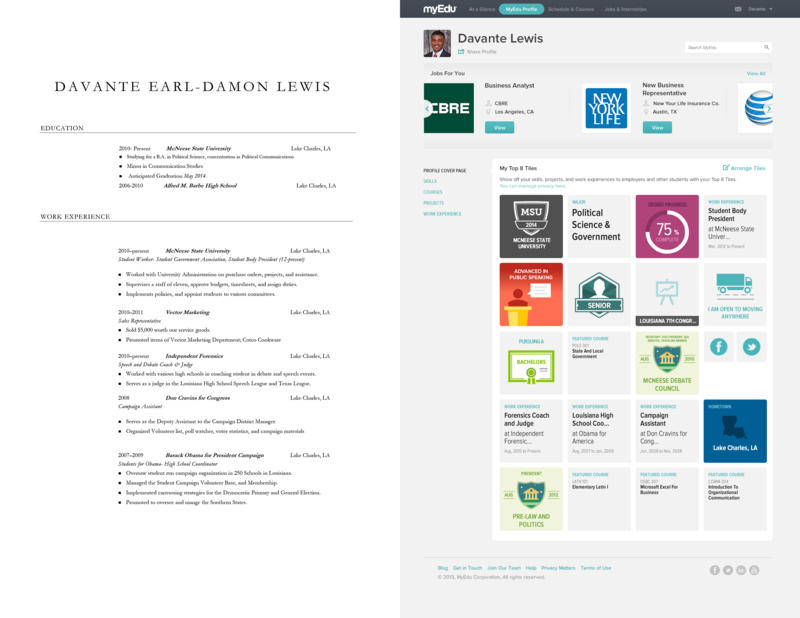 MyEdu’s academic, profile, and job matching tools are offered free to institutions and students. MyEdu’s employer customers pay to post highly targeted jobs and internships as well as build mentoring relationships with students, helping them to build the skills and talents necessary for success in their career. Woodley told the board she expects to return in the next couple of months with an update on the initiative and the employers who’ve committed to the project. For a demonstration contact MyEdu at sales@myedu.com. The University of Louisiana System is Louisiana’s largest higher education system enrolling over 92,000 students at the following nine universities: Grambling State University, Louisiana Tech University, McNeese State University, Nicholls State University, Northwestern State University, Southeastern Louisiana University, the University of Louisiana at Lafayette, the University of Louisiana at Monroe, and the University of New Orleans. MyEdu is the top destination for college students to manage their academic journey, build their first professional profile, and connect with employers. 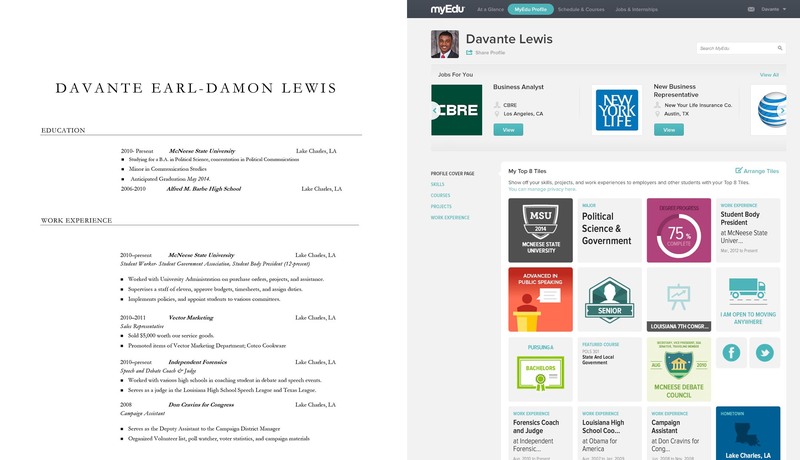 From the day they begin college students can utilize MyEdu’s data-rich applications to plan their course of study, visually display their skills and credentials, connect with hiring managers and secure jobs and internships. The platform is currently used by more than 1 million students across thousands of campuses nationwide and has been endorsed by corporations and major higher education institutions for its mission to increase Return on Education (ROE). MyEdu is based in Austin, TX and backed by the University of Texas System and Bain Capital Ventures. Visit MyEdu.com for more information.